Budding Computer Scientists show off new skills and projects. 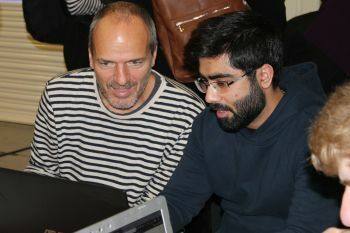 As part of the introduction to their Computer Science degree, City, University of London's First-Year Computer Science students went through a demanding but rewarding Coding Bootcamp. The experience began on 24th September and culminated on 5th October with a vibrant display of their interactive and graphical projects. The 210 students were divided into several groups. They took over the civil engineering laboratory space in the Tait Building, showcasing their completed projects on the walls of the lab. 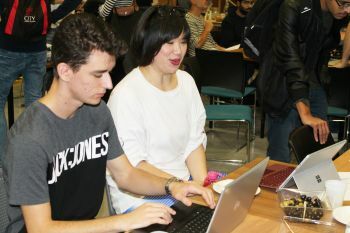 They used Processing, a dialect of the Java programming language, to create a wide range of apps including interactive artworks, music visualisers, mathematical demonstrators and video games. 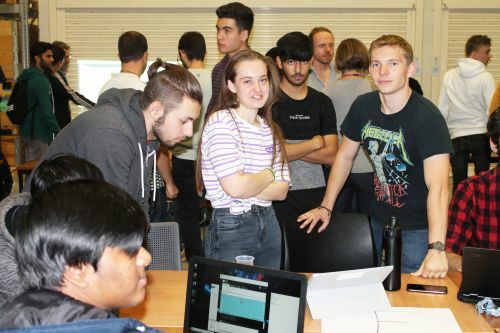 "What I think is really valuable about the coding bootcamp, is that students get a very real sense of learning something new, of being able to achieve something by the end of the two weeks that they would have thought impossible at the start. To see so many students have 'ah ha!' moments as new concepts fall into place makes this a rewarding experience for students and staff alike."